Ken Overcast is the real deal. In this day and age of plastic throw away everything, to find someone that is really genuine is a treat indeed. While many in the performing arts tend towards honing an act that is saleable, Ken strives very diligently to just be himself. His music, writing, and public performances are characterized by a down home connection that is indeed rare. He is a third generation Montanan, and is truly making a mark on America’s entertainment. Both Ken’s recording and writing have been very prolific. Having written about half of the music he's recorded, there are currently eight CD's in his Bear Valley Records catalogue. Visions of several more recordings are in various stages of planning, with available time being the only constraint. 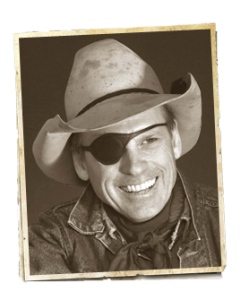 His CD Montana Cowboy was named Cowboy CD of the Year by True West Magazine, and contains the song Montana Lullaby, co-written with Wylie Gustafson, which was selected as The Official Lullaby of the State of Montana in an act by the Montana Legislature. The most recent recording project, entitled Montana In My Soul, expounds upon Ken's love for the West and his home in particular. His first book, Yesterday’s Yarns, was published in 2003 and quickly went into several successive reprints. He has authored five popular books of short stories to date, with yet another scheduled for release in the fall of 2012. Ken’s fourth book, Sittin' 'Round the Stove, Stories From the Real West, garnered the Will Rogers Medallion Award it the Fall of 2009, and the most recent title published is entitled Fables From the Far Far West. He’s also the author of a popularly syndicated column entitled Meadow Muffins, and is the host of a nationally syndicated radio program, The Cowboy Show with Ken Overcast, which features both contemporary cowboy music and interviews, as well as a look back into the past with memories from a few old time cowboys. 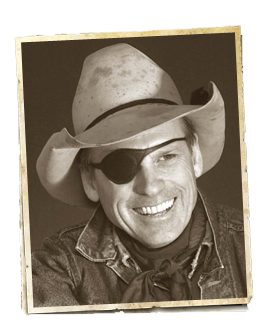 Born into a ranching family, he was raised in northern Montana on a section of the Milk River known as “Paradise Valley”. He literally grew up on a horse, and attended a rural school with three classmates. 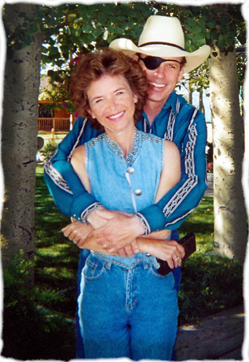 He and his wife Dawn were childhood sweethearts, and run a commercial cow/calf operation on Lodge Creek, as well as entertaining audiences all over the West. Their ranch is located within fifteen miles of where 100 years of both sides of their family have made their homes. Dawn’s only complaint is that, “He is always running off somewhere to play that darned guitar, and leaving me home to do all the work.” Ken has been teamed with Nashville Producer, Russ Ragsdale for many years, and together they have eight CD recordings under their belts. National recognition was just a matter of time. Besides a host of nominations, Ken was crowned the Western Music Association Yodeler of the Year, and was awarded the coveted Will Rogers Award by the Academy of Western Artists.